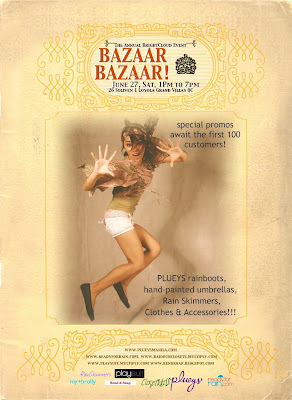 manila fashion observer: Celebrate The Rain at the Brightcloud Bazaar! All roads lead to the Laguna & Alabang Ballroom of The Bellevue Hotel, Alabang for Exciting, Value-for-Money Retail Satisfaction! Don't miss Four Seasons Bazaar at the Vue on July 25 & 26, 2009, Saturday & Sunday, 9 AM to 7 PM, where choice vendors from Manila's best fashionistas and creative entrepreneurs will offer unique Gift Ideas and Rare Finds...not to mention Delicacies and Gastronomic Creations- all at Bazaar Bargain Prices!!! With over 70 vendors under one five-star hotel roof, this event promises something for anyone and everyone! for a relaxing and absolutely pleasurable bazaar shopping experience! Present a print out of this e-mail for Free Entrance to the Bazaar. Christmas Bazaars are rushing in time for the early Christmas shoppers! Here’s Four Seasons Bazaar schedule that’ll be happening soon south of the metro. The “bazaar season” occurs in the months leading up to Christmas. As to any Pre-Christmas bazaars, a wide variety of merchandise items and a wide range of prices will be available at the Four Seasons Pre Christmas Bazaars. Many different types of goods will be for sale, such as clothing, shoes and handbags, jewelry, home wares, pottery, picture frames, greeting cards, Christmas decorations, toys and food items and a lot, lot more. So come and shop at Four Seasons Bazaar - a real shopper’s mini paradise, with many beautiful and unique items to be found and at relatively inexpensive prices. Find those special items that you “must have” or unusual and delightful gifts for friends and family. The Four Seasons Bazaars will be at The Bellevue Manila, a safe, comfortable and pleasant environment. Open from 9:00 am until 7:00 in the evening each day. Four Seasons Creative Ventures Inc.